Seattle Solidarity Network beats a national real estate company with the help of visiting organizers from other solidarity networks. SeaSol's latest victory is over FPI Management, a national real estate management company with properties in over ten states. This particular fight focused on a case of blatant deposit theft at Tressa, a north Seattle apartment complex. When Hayward moved out of Tressa, he and his family were told the apartment looked fine and only $60-70 would be deducted from his security deposit for general cleaning. However, Tressa kept $388.44 from his deposit claiming they had to replace the entire carpet due to stains. When asked for evidence, Tressa management produced pictures of a filthy carpet from a unit that was not even Hayward's apartment! Hayward's younger brother Sahara was considering taking the property manager to small claims court over this theft, but when he heard about SeaSol he decided to take the direct action route. As usual we put up "DON'T RENT HERE" posters around the neighborhood and eventually some of other FPI owned properties in the area. Through online research and hearing from other tenants, we learned that cutting corners on maintenance and ripping off tenants seems to be FPI's basic business practice across the country. The weekend of our first picket at Tressa happened to coincide with our first International Solidarity Network Conference! 15 representatives from solidarity networks and similar organizations were in town to share experiences, get trained on specific skills and learn from each other. The timing could not have been better. 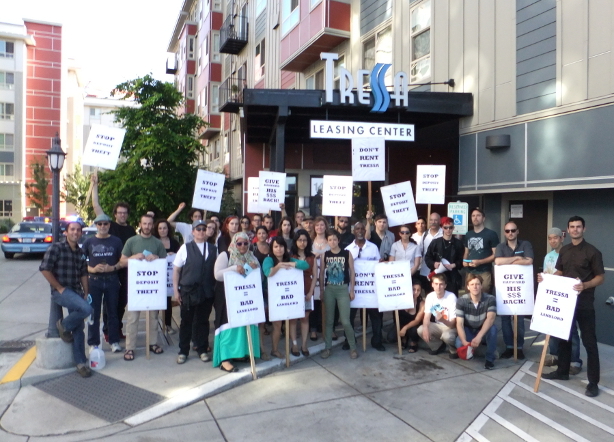 What started off as a small picket directly in front of Tressa's leasing office eventually grew into a rowdy 40+ person picket as conference attendees and local SeaSol members came over by the carload. We got attention from everybody: office staff, current tenants and even prospective tenants who were in the middle of a tour. A week later, Hayward received a check sent via overnight mail for the remainder of his deposit. Thanks to everybody who supported the fight, especially our out of town guests from Steel City Solidarity, Kitchener-Waterloo Solidarity Network, Jewel City Solidarity Network, San Diego Solidarity Network, Portland Solidarity Network, East Bay Solidarity Network, Sonoma County Solidarity Network and the Victoria IWW. "SeaSol's latest victory is over FPI Management, a national real estate management company with properties in over ten states."